HeadAmp first started designing headphone amps in 2002 while owner and chief designer Justin Wilson was still in college. Justin was making headphone amplifiers based on designer Kevin Gilmore’s design and selling them first through a now defunct website called Headwize. Most of the marketing is done now through Headfi.org , the largest headphone community in the world. HeadAmp has developed into one of the leading producers of headphone amplifiers being sold today. The average wait for HeadAmp’s amplifiers usually runs from 4-8 weeks depending on the models that Justin designs. The Pico Power is an original design, and will take about 6 weeks from when you order to actually get the product. Per HeadAmp, the waiting should drop considerably once the current backlog has been filled. It will drive most portable and full size headphones currently produced and can be used with in-ear monitors as well. 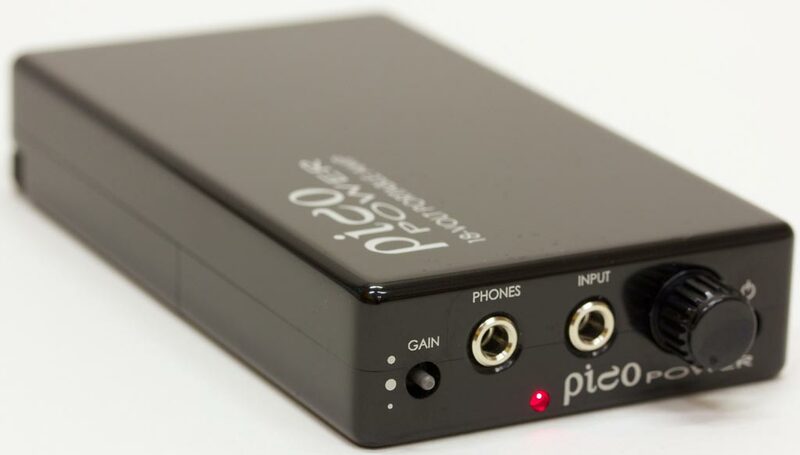 The Pico Power is a portable amp designed to be used with either an iPod or other portable players. It uses traditional mini jacks like most portable amps and can also use the standard mini-to-mini jack to connect to an iPod. 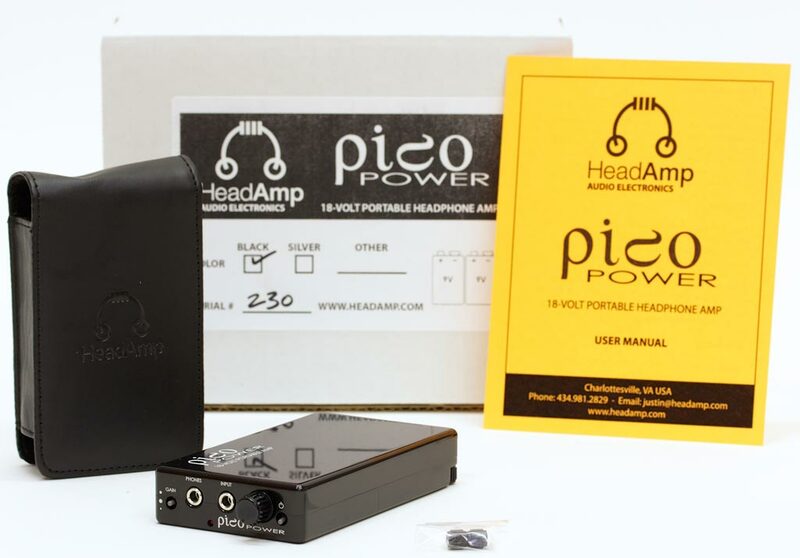 The HeadAmp Pico uses an op-amp gain stage and a diamond Buffer for the amplifier power. The included alkaline batteries last closer to forty hours. Most NiMH rechargeables will be around twenty. The lithium rechargeables will be around forty. The lithium primary cell batteries, which are non-rechargeable, will last about eighty hours. It has a single 1/8 mini jack in the front. The HeadAmp Pico Power comes nicely packaged with two batteries in a handsome leather case to protect the amplifier. The foam in the box is designed to allow for up to four additional batteries to be included or transported in the box by the owner. It is a solid, slightly heavy portable amplifier that can be attached to a portable player using the mini-to-mini single cables. The amplifier is warranted for three years. It is available for sale online at HeadAmp.com. The powers rating for the Pico are very impressive. The little portable with the 9V alkaline battery will deliver 1W into 25 ohms, and 720mw into a 50-ohm load. It also does high impedance cans very easily with 450mw into 100 ohm and an impressive 250mw into 200 ohm headphones. The power is very significant for a portable amplifier. The iPod touch was the primary source I used for music stored lossless on iTunes. The headphones used for this review were the portable UE6000 and Beyer 770 80-ohm studio monitors. I also used the Ultimate Ears Triple Fi 10 and UE18 in-ear monitors. I used a single mini-to-mini Filo cable to connect the amplifier to the iPod Touch. Music loaded from iTunes included female and male vocals plus a good assortment of jazz, blues, pop and rock music. The review period was conducted over a three-month period. The first thing I noticed was that the Pico Power was very dynamic, while its tonal balance was more on the warmer side. It had a very deep and extended bass and the treble was nicely extended. The Pico took the iPod and brought it up another level, not only to be more dynamic but also adding more musicality. The midrange became clearer and more defined. The Pico removed a level of grain that was apparent while using the iPod separately. The bass went much deeper with the Pico and the treble became more extended and less splashy and crisper with the Pico. Another good review. Keep it up. Thanks Ross. Enjoyed this one. Great write up Frank! Looking forward to hearing this beauty soon.